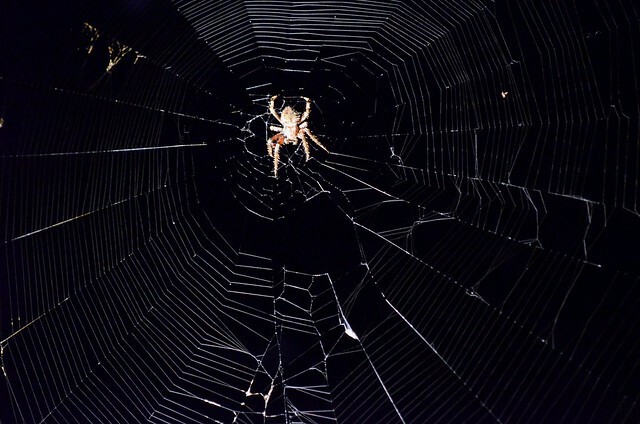 Last Saturday night my husband noticed a spider spinning a web right outside our back door. After watching the spider for awhile through the door, we got brave and opened the door. It did not phase or slow down the spider one bit. I tried and tried to get a good photo of the spider, but was unsuccessful. It was so dark and the spider was moving so fast. It was amazing to watch the spider weave this magnificent web. I could have watched it for hours. This was the best photo out of the bunch. The next morning when I woke up I immediately checked the back door, but the spider and web were gone. I didn't think much of it until Sunday night. After the kids were in bed, my husband walked outside to gather some bathing suits and towels that were outside drying. He walked right through the web. After a quick check to make sure the spider wasn't on him, we looked outside and saw the spider getting back to work on a new web. Every night since we have watched the spider come out of hiding just as the sun went down. It is truly an amazing thing to watch. I am not too sure how long the spider will be around, but for now I will enjoy our nightly web weaving show. Maybe tomorrow it will say "Radiant" :) We have a ton of spiders around here. I have learned to cohabitate with them but I don't love it. At least they stay outside but I know better now than to just run outside at night. I turn on a light and check first. We have some Black Widows so I get nervous. Great capture mama! have you named her Charlotte? we too have our share of webby spiders, but none that we see on a nightly basis! I had almost the exact same thing outside my back door last night! But I was too afraid of the spider to open the door.... ;) I was so surprised when it was gone this morning...I will definitely have to make sure to check tonight -- I would NOT handle it well if I walked into the web! How fun! I love to watch spiders....and to photography them. good times. That is one knarly spider!!! But she's got a beautiful web.